Goodbye ‘Thrifty Thursday’ hello ‘Style Steal’…….sorry to change things up on you but with all of these great finds I feel like I’m practically stealing! So, hope you don’t mind the change in format because it’s here to stay! K now back to stealing. Today’s style steal are these totally fun flats for spring. The woven look is so in right now and these sandals are a perfect excuse to jump into the trend. Seriously are you seeing this hot yellow-mango color? I’m obsessed. They’re from ASOS and marked down from $88.00 to only $34.91 (psst, that’s 60% off). These are for the girl who loves to rock a t-shirt with her cut-off jean shorts but still wants to be feminine with her pretty sandals. Or you can wear them with your favorite flirty sundress to a BBQ with friends, family, or co-workers. I have officially made these my new staple sandal for spring…..and i suggest you do the same! and by ‘kray’ I mean KRAZY of course! 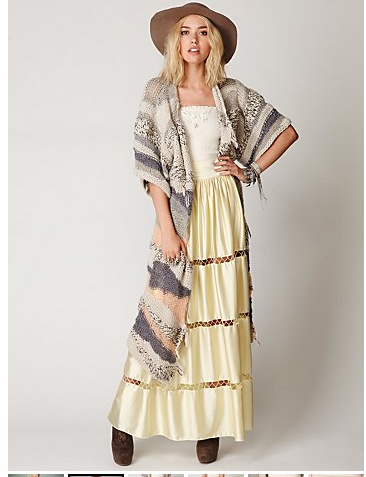 Seriously though, I am crazy about this kimono I saw on Free People. This time of year it’s really hard to shop because you don’t want to waste your money on wintery clothes you can only wear for a few more months of cold but then you don’t want to buy summer clothes that you are going to have to wait forever till you can wear. So, during this time I like to find pieces that I can wear both now and later. Get more bang for my buck if you know what im saying! Ok so back to my kimono craze! This is from Free People and it’s called the Parisian Print Kimono. It was originally $128.00 but it’s been marked down 70% off and is now only $39.95. The colors in this kimono are gorgeous. The dark background gives it a more fall & wintery feel, but the offset, bright colored florals give you the ok to rock this in spring & summer too. Honestly you are going to wear it all year round. Right now while you are are waiting for the cold to go away, wear this kimono as pictured above: with leggings and boots. But when warm comes again, lose the leggings for legs and switch out the riding boots for some strappy sandals. And if you want a fancier look, don’t be afraid to layer it on top of a skirt or dress….the layers of flowy will look super pretty and compliment each other if you tie it all together with the right belt! P.S. Not only is the Parisian Print Kimono accommodating to different seasons, it also comes in red floral! So darling. Happy shopping, happy thrifting, happy kimono, happy thursday! You may have already noticed, but I have been talking about functionality within your wardrobe A LOT lately……or in other words: fashion meets function. The deal of the day today is not only functional but also fabulously fashionable. When I think of functional clothes I think of pieces that I can wear in lots of different styles and in lots of different situations. I love this Dorothy Perkins skirt because you can pair it with a big knitted sweater to dress it down for day or just a plain top and heels for going out. 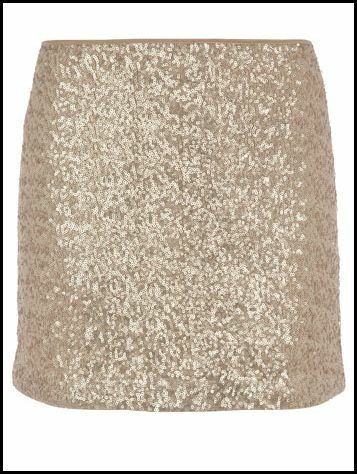 It is called the Champagne Sequin Skirt and right now it is 50% off the original price on sale for $27.00! Another reason why I love this skirt is because it is a perfect wardrobe transition piece. Buy it now and wear it to finish up winter with some tights and boots. And then, when the really amazing and really warm weather comes, show off your sunkissed legs in this pretty mini as you welcome Spring! Happy sequence, happy shopping, happy thursday! Thurs. Deal Day: Free People Moments That You Can’t Miss! Ok you know I love a deal and most of all I love Free People! So today’s deal is all about the Free People I love and the items you must have enjoy!!! Happy Shopping some great deals. It’s always a great day when a free people box hits your door step! Happy deal shopping. Much love! I cannot BELIEVE this year is almost over. It went by way too fast. I hope you all had an amazing year because now it’s time to celebrate! New Years Eve is just a few days away and I just found the most adorable party dress for you to wear. The all-over ruffles on the front of this dress are so feminine. I love it! This is the CiCi Bandeau Ruffle Dress and I found it online at ASOS. It used to be $81.81 but it’s been marked down 60% to just $32.72. Squeal! Oh yeah and also, when you order from ASOS you get free shipping…both ways…everyday. Squeal again! Now’s the time to let loose of all the stresses of 2011 and ring in the new, fresh slate 2012! So get dressed up, put on your dancing shoes and slip into your party dress…..and make sure its your ruffle party dress!! Deal Day Thursday: I’m Dreaming of a Sparkle Christmas! Christmas is the sparkliest time of the year! Pretty lights sparkle on houses & tinsel sparkles on trees & that means it’s only right that WE sparkle too! This is the Luxe Wide Charm Bracelet from Express. 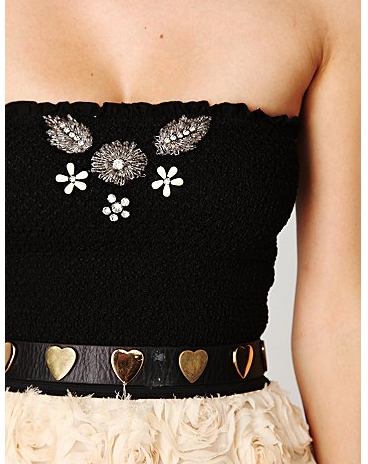 It’s so edgy and pretty and sparkly and perfect, all at the same time. Regularly priced at $88, it has been marked down 40% to just $52.80!! This really is a must-have. Rock this bracelet to take your holiday look from simple to glam!!! And don’t even think about leaving your house on New Year’s Eve without it! I promise this bracelet will take your outfits to the next level of amazingness. Here’s to blingin in the New Year everyone!! Happy Thursday and Happy Holidays!